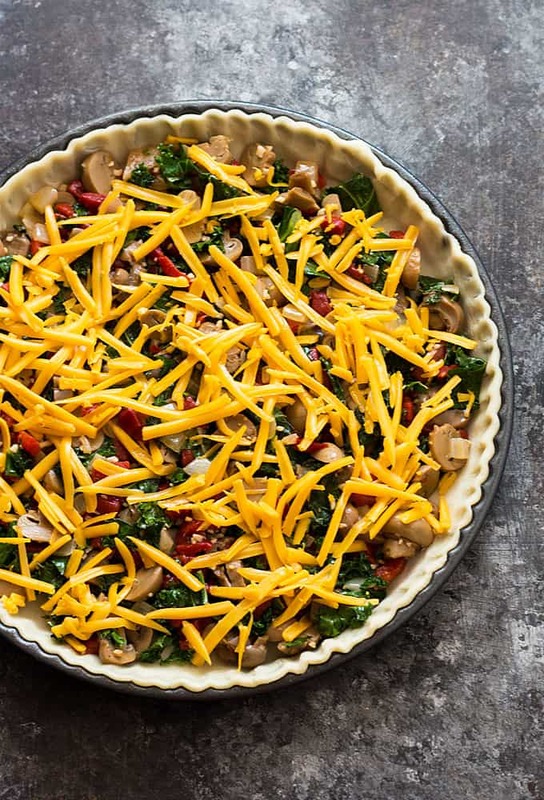 This vegetarian Kale Quiche is so hearty, you’ll never miss the meat… it’s chock full of kale, roasted red peppers, mushrooms, onions and cheese! 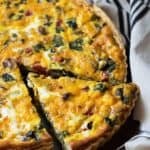 This is no doubt one of my favorite quiche recipes originally posted a little over a month after starting the blog. 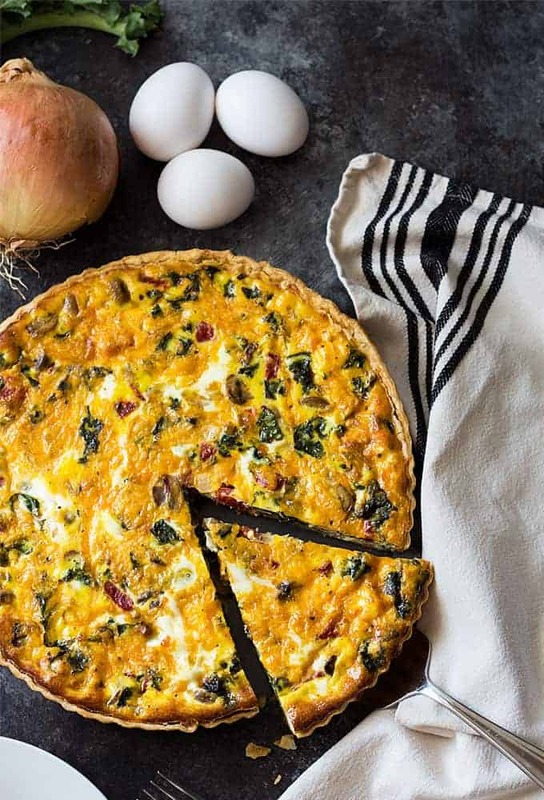 I love quiche because it’s so versatile – quiche can be served for any meal of the day! It all starts with an easy refrigerated pie crust filled with the kale and vegetable mixture. Then top it with shredded cheese and pour the egg mixture on top. 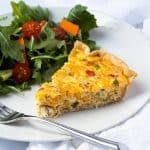 Pair this quiche with a salad for the ultimate satisfying vegetarian dinner! 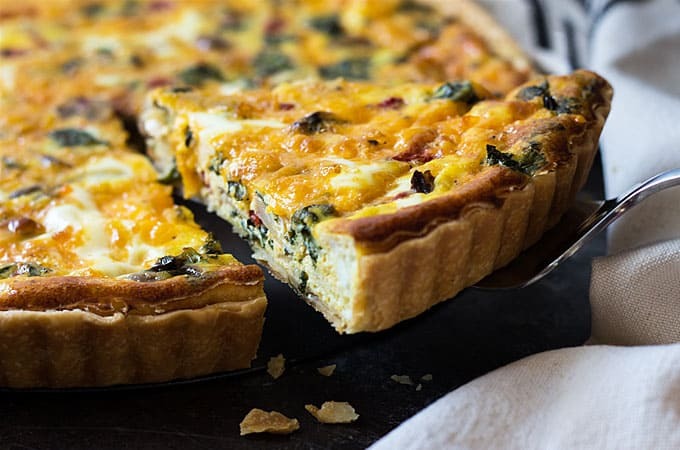 Another great thing about baked quiche is that it can be frozen and reheated easily. I wrap it tightly in plastic wrap, then put it in a resealable plastic bag. When ready to heat, unwrap and bake for approximately 20 minutes at 350 degrees F, or until heated thoroughly. Reheating an individual slice takes less time to reheat (about 10 minutes). Originally published January 24, 2012 and updated October 26, 2016. 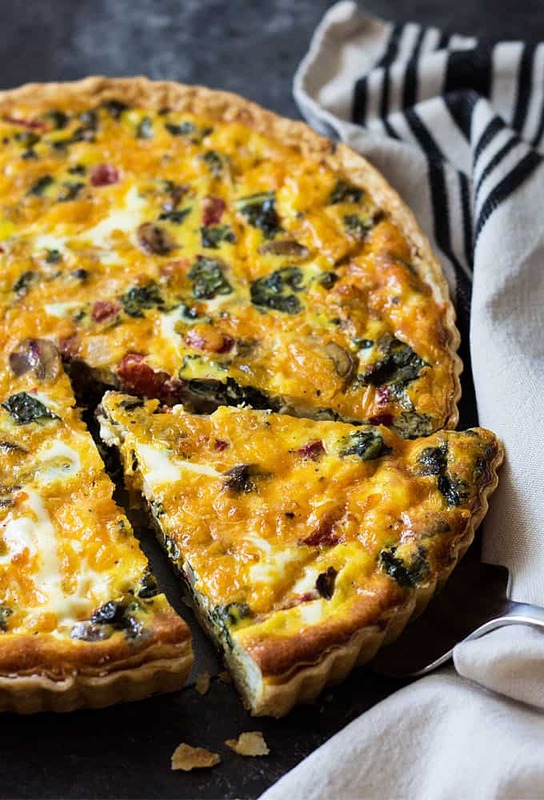 A hearty vegetarian quiche chock full of kale, roasted red peppers, mushrooms and onions! In a large skillet heat olive oil over medium heat. Add onions and garlic, cooking until onions are soft and translucent, stirring frequently (about 2-3 minutes). Add chopped kale, roasted red peppers and mushrooms. Stir and saute until the kale is wilted (about 3-4 minutes). 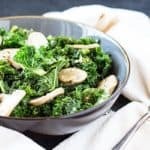 Set aside kale mixture. Spray a 9-inch pie or tart dish with cooking spray. Carefully unroll pie crust and place in dish, pressing bottom and sides. In a large bowl, whisk eggs, milk and desired amount of pepper until blended. Place kale mixture in bottom of pie crust first, then sprinkle evenly with cheese. 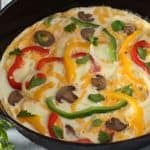 Pour egg mixture evenly over cheese and vegetables. Bake for approximately 40 minutes, or until center is firm and toothpick inserted comes out clean. Great combination ! I love me some quiche especially that anything can be added . Always fun to to pull stuff out to make this tasty meal . Can’t wait to try the kale . Thanks ! Thnanks for sharing this! 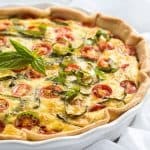 Never made a quiche but this recipe got me excited! I had some left over stuffing for my bell peppers so I decided to use it and combine this recipe! I had sautéed onions and garlic, then wilted some spinach and kale, added waterchest nuts and Quinoa. So I used this and added chopped mushrooms, chopped bell pepper, and 5 strips of cooked bacon. 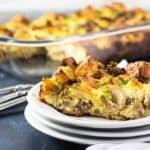 Mixed it all together and poured it into the prepared quiche dish, added sharp cheddar cheese and eggs and baked for 40 minutes!!! It turned out WONDERFFUL!!! Too bad I couldn’t post my pictures! I just made this tonight with my 12 year old daughter. 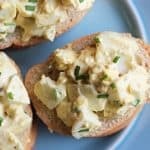 It’s sonsimple and easy to make. We can’t wait to have it for breakfast in the Am! !